I hard a hard time sorting that officer's regiment (and it doesn't help that the busby bag doesn't show). That leaves us with potentially the 3rd, 13th, 14th, 19th or 21st hussars. Let's have a closer look at the pouch belt ; it was decorated with a colour stripe in the center. At first it looks white - but experience tells that photographic renderings of that material is very deceiptive (as it is for the medal ribbons) ;and if you look at the part of the belt to the very left, you can see that it is considerably darker than the reflections would let us think - and more specifically not white as appears at first glance. Furthermore it can be seen that the prickers are covered with a plate that is decorated with a crown like design. It does not seem to be the case for Officers from either the 3rd or the 21st Hussars. 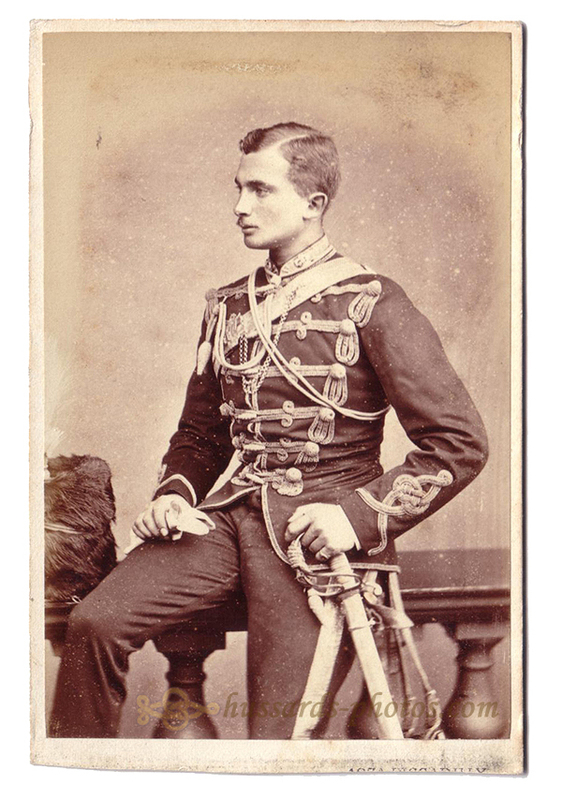 Would our Hussar be a lieutenant in the 14th ? Struggling for a glimpse of the busby bag, I realized that something was missing : it's not obvious dueto the cut of the photo, but there is no boss under the busby plume. This was a long standing custom with the officers of 14th Hussars, that will eventually be officially sanctionned in the Dress Regulations for Officers of the Army in 1900. 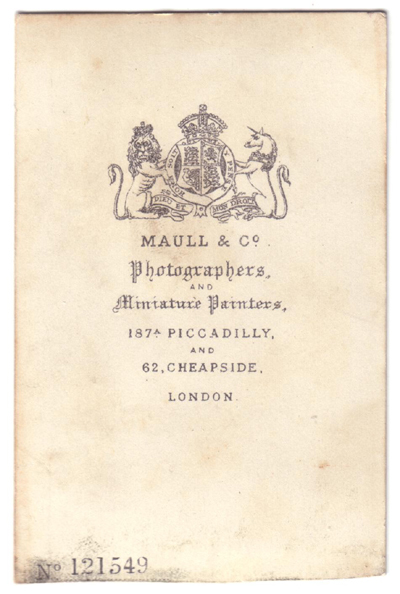 The photographer, Maull & Co, operated at the mentioned addresses bewteen 1873 and 1878. The 14th Hussars were in England 1874-75.